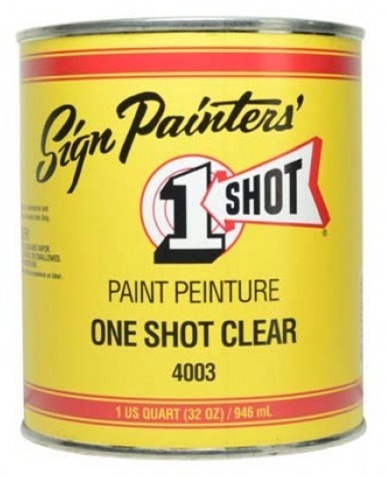 This oil based clear product may be used to partially restore gloss level and color on signs originally painted with 1 Shot Lettering Enamels. Also for use as a protective coat on gilded surface, as well as backing up gilds in second surface glass applications. A waterborne primer/barrier intended for use on most flexible synthetic favrics including untreated (non-ERC) banner materials, canvas, leather, leatherette, naugahyde and most synthetic awning fabrics. 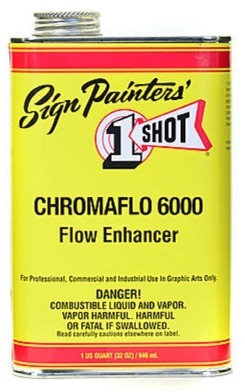 1 Shot Chromaflo 6000 Reducer is designed to act as a flow enhancing additive for use with brush applications of 1 Shot Lettering Enamels and Chromatic Bulletin Colors Not to be mistaken as a reducer, ChromaFlo, when used sparingly, will increase brush control, decrease brush drag and enhance flow and leveling characteristic; especially suitable for lettering and pinstriping applications. Available in 32oz. 1 Shot 4007 Hardener not only accelerates the drying times of 1 Shot Lettering Enamels; but enhances adhesion qualities as well. The use of 4007 Hardener also aids in preventing lifting when automotive clears are used over 1 Shot Lettering Enamels. While greatly reducing the workable pot life of your 1 Shot Enamels, adding up to 20% of 4007 Hardener in place of any other reducer, will allow for clear coating withen 12-24 hours. NOTE: As with all custom paint procedures, test panels should be utilized, and the first two coats of clear should be applied very dry. Replace cap tightly after use, to prevent crystallization. Brush Cleaner 4004 is a premium brush cleaner designed to not only thoroughly cleam oil based paints from quality, natural hair brushes, but to do so without damaging the hair of the brush. Unlike harsh spirits and reducers, 1 Shot Brush Cleaner and Condidtioner conditions,and softens the brush and can even be used to restore partially hardened natural and nylon brushes; all without interferring with the properties of oil based sign paints. 6002 High Temp Formulated to improve flow and leveling at high temperatures by reducing viscosity and retarding the evaporation process without significantly reducing the quality of the coating. 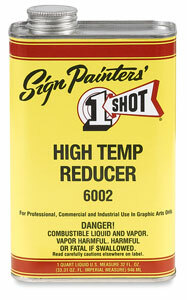 This reducer is ideal for lettering, graphics and pinstriping applications. These products, engineered for use with 1 Shot products, should always be used, as opposed to mineral spirits, turpentine and other less-than-compatible reducing agents.